Depending on your application, you may not always have direct access to the controls on your marine stereo when you need them. That's where Aquatic AV's AQ-WR-5F wired remote control comes in handy. It provides total control over your music, even when your stereo isn't easy to get to. This remote has an IP65 rating, which means it's waterproof and dustproof, so it can endure exposure to some harsh environments. You can mount the AQ-WR-5F onto a flat panel or console that's convenient for you. Its 2-way communication not only controls your stereo functions, but you'll also see song and system information on the backlit LCD display. 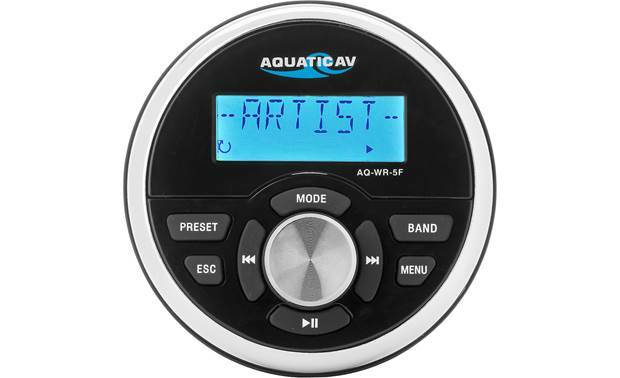 This remote is compatible with the Aquatic AV AQ-MP-5UBT and AQ-MP-5BT stereos. Note: This remote doesn't include wiring, so you'll need to select one of Aquatic AV's extension cables to complete the installation. If you're using more than one extension cable, you'll also want to consider Aquatic AV's AQ-RB-3 wired remote cable bracket to secure the connection. Waterproof Wired Remote Control: The AQ-WR-5F waterproof wired remote control allows for 2-way communication with a compatible Aquatic AV receiver, so you can control the receiver remotely while viewing song, track and other system information on the remote's back-lit LCD screen. Compatibility: The AQ-WR-5F waterproof wired remote control is designed specifically for the Aquatic AV AQ-MP-5UBT-S and AQ-MP-5BT digital media receivers (sold separately). Required Extension Cable: The AQ-WR-5F waterproof wired remote control features an attached 8" DIN-cable and will require an extension cable (such as the AQ-EXT-24, sold separately) to connect to a compatible Aquatic AV digital media receiver. Optional Y-Cable: You can use the AQ-Y-1 splitter (sold separately) to connect two wired remote controls (in this case, you'll need two extensions cables). You can connect up to 16 remotes to one Aquatic AV receiver. LCD Screen: The LCD screen lets you view song/artist/album information (not album art) from a Bluetooth source device connected to a compatible Aquatic AV receiver, as well as AM/FM station numbers, source inputs, volume level, and menu selections from a compatible receiver. Rotary & Push-Button Controls: The AQ-WR-5F features a 3-way rotary knob and 8 push-buttons for control of your compatible Aquatic AV digital media receiver. The remote offers control over source selection, volume, playback, and menu settings. Mounting Options: The AQ-WR-5F waterproof wired remote control mounts flush in the bulkhead of your boat. 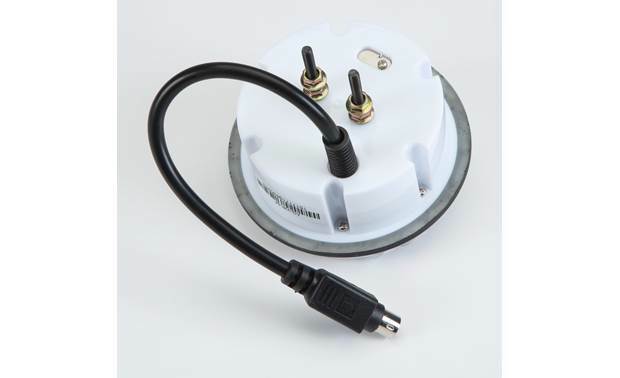 The wired remote requires a 3" round cutout and will fit in standard 3" gauge openings. The included mounting bracket and hardware secures the wired remote in place. Marine Rated: The AQ-WR-5F is a high quality, robust and durable waterproof remote control, designed and built to withstand the harsh conditions associated with use in marine and boat applications. It is waterproof (IP65 rated), UV protected (ASTM D4329 compliant), and salt-fog resistant (ASTM B117 compliant). 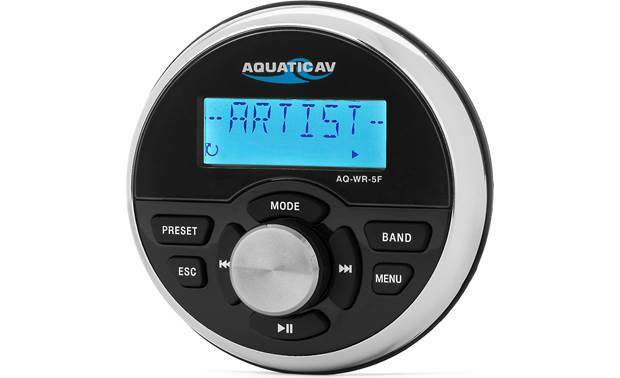 Searches related to the Aquatic AV AQ-WR-5F Wired remote control for select Aquatic AV marine stereos.